An unrelenting schedule of award winning pickers and singers fill the Planet Bluegrass main stage for 3 epic days of bluegrass. Schedules so far are Sam Bush Bluegrass Band, Béla Fleck with Alan Bartram, Jason Carter, Ronnie McCoury & Danny Paisley, Tim O'Brien & Friends, Seldom Scene, Punch Brothers, Peter Rowan, Lonesome River Band, Bobby Osborne & the Rocky Top X-Press, Michael Cleveland & Flamekeeper featuring Dale Ann Bradley, Jessie McReynolds & the Virginia Boys, Trampled by Turtles, The Infamous Stringdusters, Chris Thile & Michael Daves, Noam Pikelny & Friends, The Hillbenders, Bluegrass Etc., 23 String Band, And many more still to be announced. 3-day passes and camping are on sale now at shop.bluegrass.com or 800-624-2422. With the unprecedented ticket rush for Telluride Bluegrass, it shouldn't be surprising that RockyGrass tickets, too, are going at a record pace. Order your 3-day passes right now. Then watch for the complete single-day lineup and the release of single-day tickets in mid-February. Along with the festival lineup, check out our latest additions to the faculty of the sold-out RockyGrass Academy (July 22-26), including Peter Rowan, John Reischman, Casey Driessen, John Moore, Tyler Grant, and more. Once again we're looking for energetic, friendly festivarians to help create festival magic with us as volunteers at RockyGrass. The volunteer application is now available. For your three smile-filled 3.5 hour daily shifts we'll provide you with a 3-day festival pass. 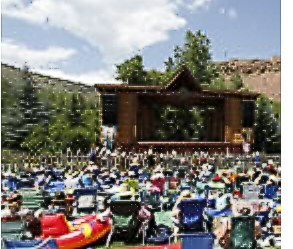 Visit Planet Bluegrass for more information on RockyGrass, Telluride and other great music events.